Senator Ross Fitzpatrick will receive an honorary doctoral degree during June 7 Convocation ceremonies at UBC’s Okanagan campus. D. Ross Fitzpatrick, a retired member of the Canadian Senate, was born to a pioneering Okanagan agricultural family, a tradition that carries on today with a variety of business interests. Upon graduating from UBC with a Commerce and Business Administration degree, he was appointed research director for the Royal Commission into the Tree Fruit Industry of British Columbia. Following completion of this, Fitzpatrick worked for the B.C. Tree Fruits Industry and pursued post-graduate studies at the University of Maryland and Columbia University. He later embarked on an entrepreneurial career founding businesses in the aerospace, oil and gas and mining industries in both Canada and the U.S. In the 1980s he returned to the Okanagan to promote value-added agriculture, founding CedarCreek Estate Winery and pioneering the planting of vinifera grapes to produce quality wines. 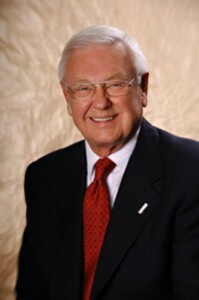 He served in the Senate of Canada, representing Okanagan-Similkameen from 1998 to 2008. Ross Fitzpatrick will receive his honorary degree on Thursday, June 7 during the 1:30 p.m. Convocation ceremony at UBC’s Okanagan campus. *This partial citation was originally released on February 14, 2012 and can be found on UBC’s Okanagan News website. UBC’s Vancouver campus holds its spring convocation ceremonies from May 23 to May 30 and fall convocation ceremonies form Nov. 21 to Nov. 23 and will confer 10 honourary degrees. Recipients include former Canadian prime ministers Joe Clark and Paul Martin; iconic singer-songwriter Buff Sainte-Marie; global commerce specialist Dominic Barton; philanthropist Robert Hung Ngai Ho; world-class ethnobotanists Memory Elvin-Lewis and Walter Lewis; St. Mary’s Indian Band Chief Sophie Pierre; Vancouver Symphony director Bramwell Tovey; and forestry researcher Michael Wingfield.